‘Streamers, sprites, leaders, lightning: from micro- to macroscales’ was the theme of a workshop in October 2007 in Leiden, The Netherlands; it brought together researchers from plasma physics, electrical engineering and industry, geophysics and space physics, computational science and nonlinear dynamics around the common topic of generation, structure and products of streamer-like electric breakdown. The present cluster issue collects relevant papers within this area; most of them were presented during the workshop. We here briefly discuss the research questions and very shortly review the papers in the cluster issue, and we also refer to a few recent papers in this and other journals. Ebert, U, & Sentman, D.D. (2008). 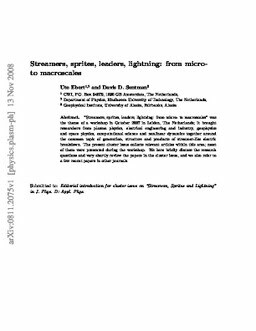 Streamers, sprites, leaders, lightning: from micro- to macroscales. Journal of Physics D: Applied Physics, 41.